We must look beyond technology as a way to save money or increase convenience, better understanding what each consumer wants. It’s that foundation that allows banks and credit unions to engage, integrate, and learn from every interaction. The mission of each financial institutions is to provide consumers a view into the future as opposed to just a report on what has already occurred. Working as a digital concierge, banks and credit unions must move beyond just personalization, offering consumers insights into financial planning and their financial health. Finan­cial institutions also must leverage human resources as a channel for more complex transactions and deeper engagement when desired. 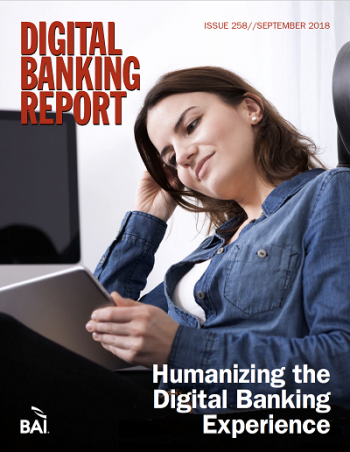 There must be an effort of humanize the digital banking experience. The concept of humanizing digital banking means moving from ‘next best product’ to ‘next best event’, focusing on long-term relationships and on partnering with consumers. This requires real-time engagement, aligning recommendations with the goals that customers have for themselves. We would like to thank BAI who spon­sored the survey deployment and devel­opment of this report. Their partnership enabled us to continue to do the most comprehensive digital banking trend analy­sis in the financial services industry. We believe this year’s report provides an excellent perspective on how financial institutions can move beyond simple per­sonalization on to humanizing the digital banking experience. More importantly, we hope this report provides the foundation for organizations and financial marketers to embrace change, take risks and disrupt themselves. How banking organizations can move beyond generating great insights to delivering exceptional emotional experiences. Case studies and strategies used by financial services organization globally.